When a friend of mine, Rita of Jewel School Friends, was having a blog hop to celebrate Autumn I just couldn't resist. Now I live here in the Puget Sound region of Washington state and we have mainly pine trees so I can't show you the beautiful colors of this season so instead I decided to show you a bit of what it means to me. First comes first, I am a boot addict. A lot of women have hoards of shoes, for me instead it is boots. I would have hoards but they take up much more space then shoes so I only have ten pairs (so far). And this is the season when I get to bring them out as well as my sweaters. I also get to decorate my altar for autumn. This isn't the sharpest pic and I do apologize for that. It protects itself and for the life of me, I couldn't get a better one. This is also the time of year where things quiet down. I find that I spend more time reading a book or spending time in my studio. If there is one stone that bring together the colors of the season it would have to be unikite. I wire wrapped some of it together with brass wire and a brass focal to create a lanyard for my e-cigarette. Since I do tend to wear a lot of greens this season, I also made these earrings to wear using a dyed agate along with copper findings. And last for but not least is a necklace I made using polymer beads from Tree Wings Studio and a boro glass focal from an unknown artist. So what does this time of the year mean to you? Do you love all the festivities that are about to start or is this your time of the year to hibernate? Well now that you have had a chance to check out my thoughts be sure to click on the links below to see what these wonderful people love about this season. Your jewelry creations are pretty! Congrats on capturing autumn! Those earrings are simple and elegant, I think I would wear them all the time. Both necklaces came out beautifully as well. I never thought what stone brings together the colors of fall, but unakite is a good one. I looked at a few of your other posts. 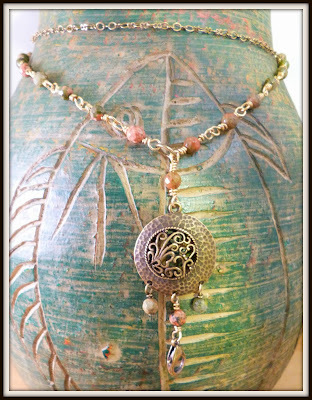 The do-over aventurine necklace is great. 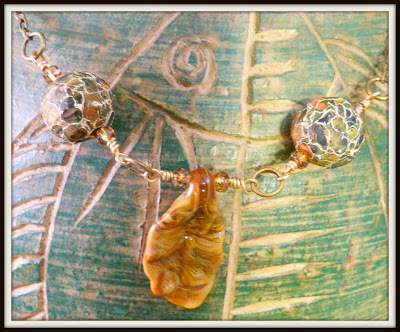 I love those wavy spacer beads you used between the stones, and your wire work is great. I was glad for the reminder to focus on blessings. We all have them, but it can be easy to forget they are there. Thank you so much Liz. I really have been neglecting my blog for the past few months so I am trying to get back into the habit of posting more again. Ten pairs of boots? Wow, that's a lot! I enjoyed reading your post and the earrings are my favorites - simple, but elegant and you can use it in many different outfits. Like I said, I am an addict. I love your boots; now I want to see the other nine pairs. Thank you for sharing your altar with us. This is my favorite time of year. Just the thigh-highs or them all? What amuses me is how the guys go gaga over those boots. Wow, great pieces! I love the last one. It really speaks to me. And of course we women can never have to many shoes....I mean...aren't we supposed to coordinate....lol. Great post. Thank you so much. I just wish that I had been able to get a better picture of it. Wonderful creations and I can relate to the boot addict part! Beautiful! You have great photos and a wonderful way with jewelry and I WANT YOUR BOOTS! Thanks! I really struggle with pics. I have so many pieces that I need to get up in my shop but that means I would have to get some good pics. My hubby would love it if I sent off my boots. He is always complaining about the room they take up in the closet. I too live amongst evergreens, gum trees in my case. Unrelenting green can get a bit blah after a while! That is the most beautiful lanyard I've ever seen. Enjoy boot weather. Mine sadly sit in the closet since I moved to this island. Next year I'll be in a cooler climate and back in boots. Beautiful pieces! I really love that first necklace - the colors are gorgeous! I, too, love boots but only have 3 pairs that I really like to wear. Love the lanyard as it looks very versatile. Good luck in being more active on your blog. I struggle with regular posting. So much to do. 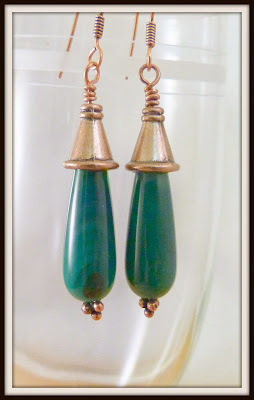 Very beautiful pieces, I love the green earrings. Wow 10 boots, very pretty one in the photo and my color too. Lovely jewelry, Shaiha! I love the Autumn (and boots!). You've captured autumn really well, love your jewelry pieces. Wish I could wear boots but think I'm too short for them. 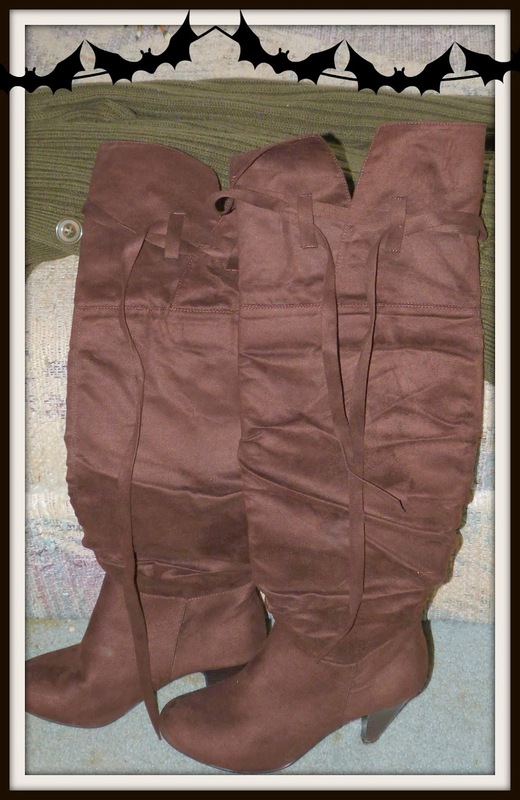 Hello Shaiha, like you I'm a boot addict (-: these boots look gorgeous! I love the idea for the pendant for your e-cigarette, very smart... My favourite is the pair of earrings, such a ♥beautiful♥ green colour. I love this time of the year too, with its 'silence', yep, time to light some candles...!